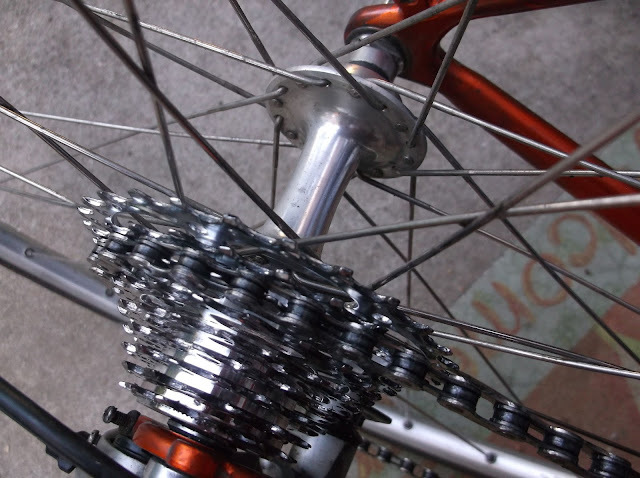 In cycling, as in other areas, the wise traveler tends to her drivetrain. Besides tires, the chain, cassette, and chain rings allow you to move forward. With lots of miles, these things do wear out. March and April were light mileage but between May 4th and June 8th about 2000 miles were piled on. Thursday night with Danny's help I replaced the Waterford's cassette and chain. The cassette was original, with over 7000 miles since the beginning of this blog. It has served well... We put on a smaller cassette, to ease shifting issues. The chain is probably the third chain. From tired and done to new and smooth! That will help with the tour from Ashland to Alturas, where I'll help support the Gold Rush Randonnee.